Jamie and Claire. – Page 2 – My Outlander Blog! Choices…..Jamie and Claire…Outlander returns April 4th. Jamie chooses to rescue Claire. Even though it means going back to a place full of devastating emotional significance, at the possible cost of his own life. There is never any doubt in his mind that Black Jack will kill him if he’s caught and there is never any doubt that he will go after Claire despite this knowledge, even though he believes she left him on purpose and that she may indeed be an English spy. We finally begin to see what kind of stuff this man is made of. Jamie chooses to let Claire go. What this choice reveals about him is nothing short of staggering. This is a man of integrity. Everything he feels tells him to beg her to stay, but he chooses to let her go…why? He now knows the truth and it cannot be ignored. There is a man…a husband … with a prior claim. Claire is the wife of another man and as a man of that honors these vows spoken between two people, he must acknowledge Frank’s claim on Claire. She isn’t his wife because she is still wed to another. He must acknowledge that Claire doesn’t belong here. Her being here and with him is an unfortunate accident. She had no choice. She did what she needed to do to survive. And, after the witch trail , he knows she is a women out of her time and it will place her in danger again. She will be safer if she goes. He knows she has tried to get back to her husband and life over and over again. He will not add himself and his need of her to keep her in a life that was not of her choosing. I know I cried at every agonizing staggering step he took down that hill; my heart was breaking with his. She finally knows where she is and it’s near the standing stones. She can finally attempt to go back home. She makes the choice to leave the 18th century and…Jamie. She knows he will be hurt, but believes after a time he will move on. She feels guilty and I think even then an inkling that she feels more than sad to leave him. Then comes Fort William and her daring rescue from the clutches of Black Jack Randall. The time that follows is filled with conflict between Jamie and Claire. These conflicts give rise to confusion for Claire. What does she really feel for Jamie? 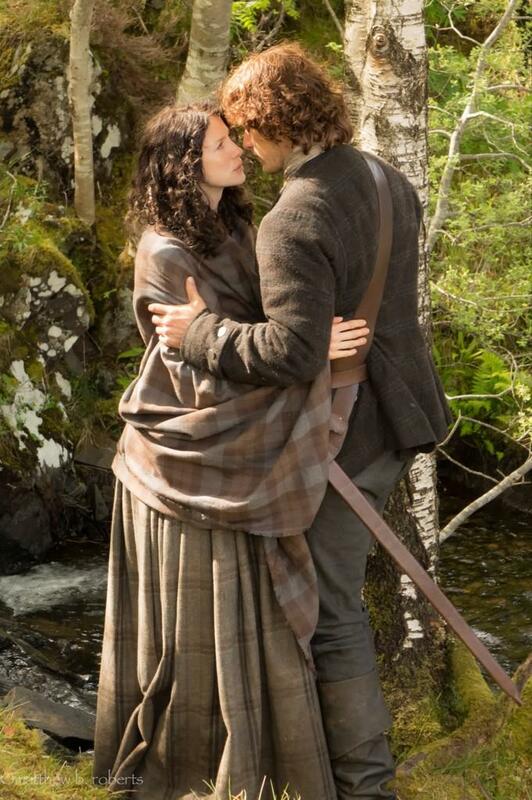 I’ve heard Caitrionia Balfe say that, “Claire has to get honest with herself and Jamie.” I was glad to hear that. Otherwise, the scene at the standing stones later would not have the emotional impact needed for the audience to believe her choice was tearing her apart. And that choice. I was really truly worried about her decision. I’m hoping the viewers of Outlander on Starz will feel the same anxiety. There are still many choices left after Craig Na Dun. I can remember thinking, when I first read, that their getting on the horse to go to Lallybroch seemed like a logical place to end the book. And, it would have been if Diana had only been writing a romance. But, in a very real way the choice at the stones was the beginning not the end. Because,… Ms. Gabaldon was writing a love story. Thank God! From the moment Claire walks away from the stones and her feet pick up speed down the hill to the abandoned cottage, we start to see the results of her choice. We are then treated to the beginning of a story about a passionately committed couple and their life together. That life continues to be full of struggles and choices; can anyone say Wentworth? But, there is never any doubt that they are together because they want to be…need to be. Claire can’t “bloody well” live without the man and neither can we.